This dystopian story is tightly crafted with a well-developed landscape of danger and mystery. Set in a dystopian future ruled by religious fanatics and a cruel military, External Forces is a fascinating, exciting fantasy. A group of young adults who are absolutely repressed by society and given no acceptable options for their future must choose to make their own path, though the consequences could be deadly. At age sixteen, Jessica Grant is in trouble. She has been selected for early assessment by the devotees—the religious rulers of society. If they find the small brown spot that recently appeared beneath her ribcage, they will know she is a Deviant, and they will make her disappear. Her best friend, Jay, convinces her to join the Special Forces with him. This gets her out of the assessment, but the military is far from safe. When she is selected to join Sergeant Matt Anderson’s Black Ops team, she is terrified her teammates will discover her secret. Jess has to figure out who to trust if she is going to survive. From the very first page, External Forces is engaging and entertaining. The story is tightly crafted with a well-developed landscape of danger and mystery. Jess is a compelling character. So many teenagers think they are different, that they don’t quite fit in with their peers. Jess’s status as a Deviant, coupled with her struggles with social awkwardness, makes her very relatable. Supporting characters Jay, Matt, and Sheree are all likable and interesting with their own well-developed personalities and histories. With no trustworthy authority figures in their lives, the teens must find their own way, figuring out who they are and what they want to contribute to their world with just each other for support. 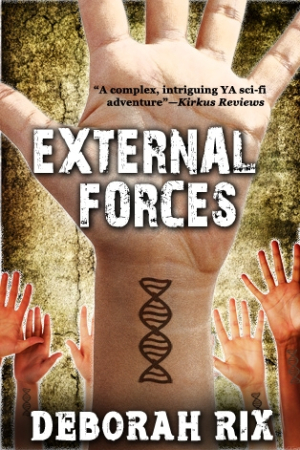 External Forces is the first in a trilogy about Jess and her friends, and there are many unanswered questions left for future books, which is both intriguing and frustrating. By the last page, these characters are really just starting their adventure. It will be exciting to see where Rix takes them next.